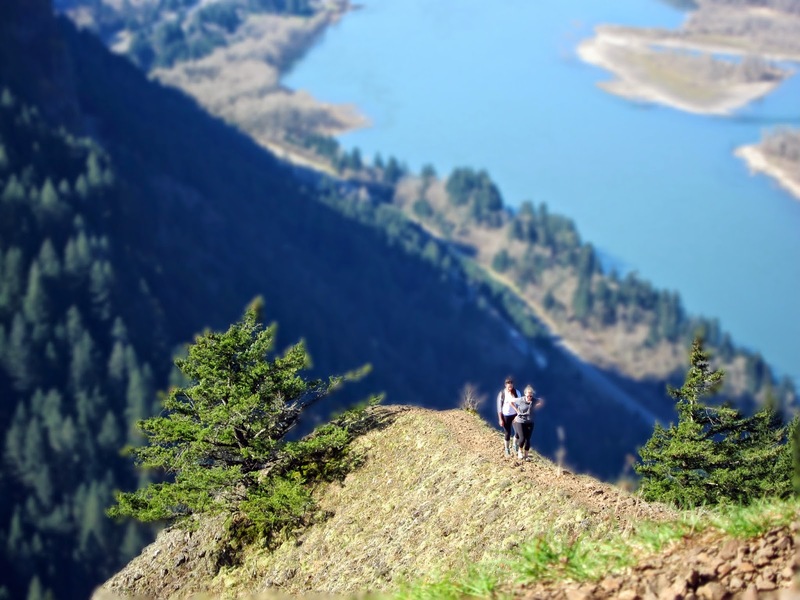 I had read about this hike in Walking With Wired's blog and she mentioned that it is one of her favorite hikes in the Gorge. Figured I'd better check it out! I also found this great pic when Googling about this hike. I started at the Wahclella Falls parking lot and headed back west on trail #400. The parking lot was already full at 9:30 so I had to park down the road a bit. Intersection to trail #400. You go straight up for a quarter mile or so on some switchbacks. Then it flattens out and follows I-84 for a mile. The trail needs a little maintenance as you can see here. Despite what I had read online, I saw no sign for the intersection to the Munra Point trail. Wasn't hard to spot though. The trail goes up some brutal switchbacks. There are 'shortcuts' that go straight up the hill in some places, like in the picture above, but I stuck to the trail as it proved to be easier and my sense of guilt at the environmental damage these user trails add. Besides. what's the hurry? The trail continues through the woods. Eventually you reach the end of the steep switchback section and climb on top of a very cool and narrow ridge. Above you can see the first nice view of the hike looking back west.. There's a trail junction that leads a few hundred feet out to this point.On both sides it drop nearly straight down so I decided not to walk all the way out. I did see a bald eagle flying in the valley below me. There are several parts of the trail where you climb over rocks. Because the trail follows the narrow ridge top there's no way to avoid these rock sections. They aren't difficult though. A nice view of Beacon Rock framed by the trees. A switchback on the trail that goes through a super cool grove of dwarf oak trees. Getting near the top. The trail makes it's way up and goes between the two trees in the left of this picture. Between those trees someone hung a rope to aid in climbing the section. I climbed the rope and crested the ridge to see the very top of Munra Point. 'Whispering Bear' taking some photos from the top. A couple of dudes at the top who remembered to bring something I had forgotten- a reward beer. A view to the east of the ridge line, Bridge of the Gods in the background as well as Cascade Locks and Stevenson, Washington. Bear Whisperer walking out the ridge line that heads to the south. It's hard to tell from this angle but it's very steep on each side of where's he walking. If he fell it would be some distance before he stopped. Hikers cresting the ridge on their way to the summit. A different view of the ridge that heads northwest. One of the three ridge lines that meet at Munra Point. A hiker on his way down. Looking west. I asked Bear Whisperer to take my picture and he took 3... all vertical. A view from the top of the rope on my way down. Some cement ruins on trail #400. It would be interesting to know the history of all the old structures in the Gorge. Almost back to the parking lot- looking down at the cars from the trail. By the time I reached the road it was 12:30 and there was a traffic jam of people trying to park in the lot that was already full when I got there at 9:30. Got my reward beer after the hike at Thunder Island in Cascade Locks! I really enjoyed this hike. It took me about 3 hours total at a fairly casual pace and about 20 minutes at the top. The internet tells me it has 1700 feet of elevation and is around 5 miles round trip from trail head I started at. My biggest gripe might be that the trail isn't long enough once you leave trail #400. I want to really earn these dramatic views! I saw around 30 people total on the hike and there were 5 people on the summit when I arrived. Highly recommended! Here's some footage from the top of Munra Point.